According to the United States Department of Justice, U.S. Trustee program, Americans make less money today than eight months ago. In order for bankruptcy practitioners to determine whether a person or couple qualifies for Chapter 7, we look to the latest median income figures periodically published by the U.S. Trustee. Normally, and as anyone would expect, these figures, on average, go up every time they are published. However, this time, the numbers tell a sadly different story that the U.S. economy continues to contract. I was startled to learn that my state, Florida, had experienced a nearly 3% decline in income since the last time the median income figures were published.So, I did an analysis of the entire country, and while Florida was harder hit than most, the average for the entire country had declined! 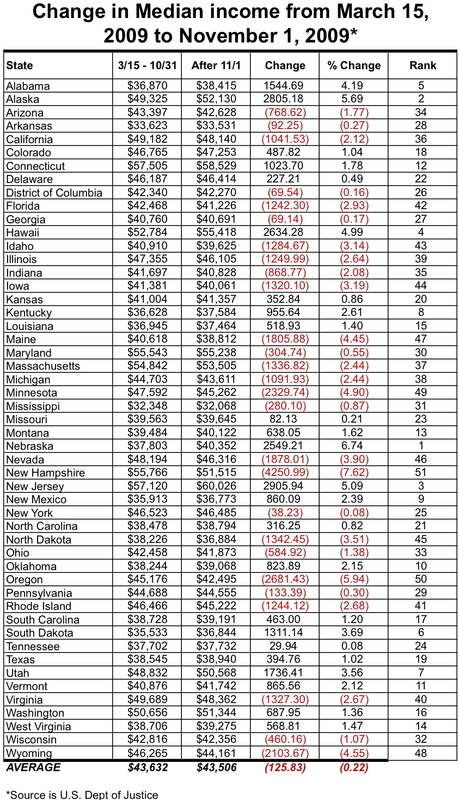 I ranked the states in order from biggest gain in income to biggest loss in income. Not surprisingly, those states experiencing tremendous foreclosure rates are near the bottom of the list. Florida and Nevada, both of which have been decimated by foreclosures, rank 42nd and 46th respectively. New Hampshire and Oregon report the worst decline, while Nebraska, Alaska and New Jersey round out the greatest increases in median income.